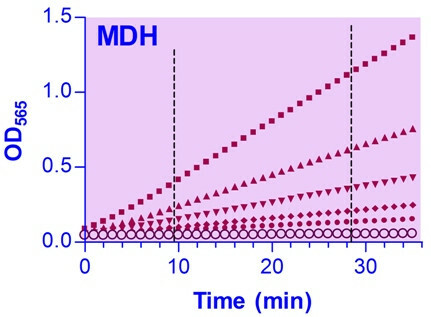 For quantitative determination of L-malate dehydrogenase enzyme activity and drug effects on malate dehydrogenase metabolism. • Fast and sensitive. Linear detection range (20 μL sample): 0.5 to 65 U/L for 20 min reaction at 37°C. Malate dehydrogenase (MDH) (EC 1.1.1.37) is an enzyme which reversibly catalyzes the oxidation of L-malate to oxaloacetate in the presence of NAD. There are 2 isoforms in eukaryotic cells: MDH1 and MDH2. MDH1 found in the cytoplasm and plays a key part in the malate-aspartate shuttle for transporting malate into the mitochondria. MDH2 is a mitochondrial enzyme which participates in the TCA cycle that reversibly converts L-malate into oxaloacetate. Higher MDH activities are found in some neurodegenerative diseases such as Alzheimer’s disease. 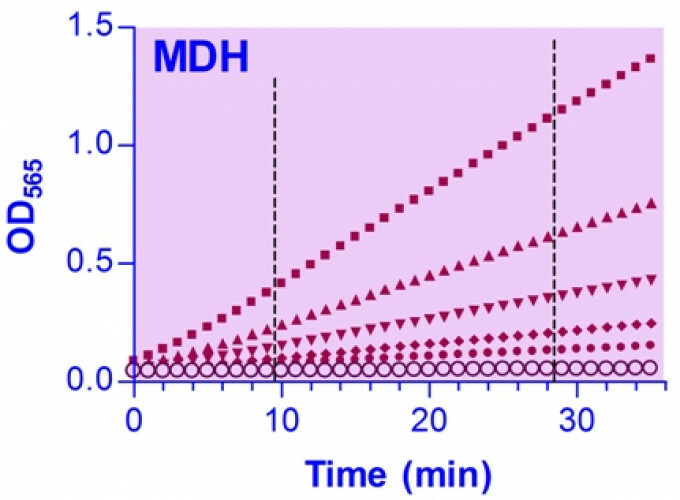 BioAssay Systems’ non-radioactive, colorimetric MDH assay is based on the reduction of the tetrazolium salt MTT in a NADH-coupled enzymatic reaction to a reduced form of MTT which exhibits an absorption maximum at 565 nm. The increase in absorbance at 565 nm is proportional to the enzyme activity. Applications For quantitative determination of L-malate dehydrogenase enzyme activity and drug effects on malate dehydrogenase metabolism. Samples Biological samples (e.g. plasma, serum, erythrocytes, tissue and culture media). References Assay: Cells in E. Coli. (Pubmed). 2. Trivedi, AK et al (2015). Adaptation of oxidative phosphorylation to photoperiod-induced seasonal metabolic states in migratory songbirds. Comp. Biochem. Physiol. A 184: 34-40. Assay: Plasma In Avians. (Pubmed). 1. Fan, C et al (2015). Rationally evolving tRNAPyl for efficient incorporation of noncanonical amino acids. Nucl. Acids Res. 43(22):e156. Assay: Cells in E. Coli. (Pubmed).